When most people think of OSHA regulations, what comes to mind is usually obligations of the construction company to keep working conditions safe by following rules and guidelines. 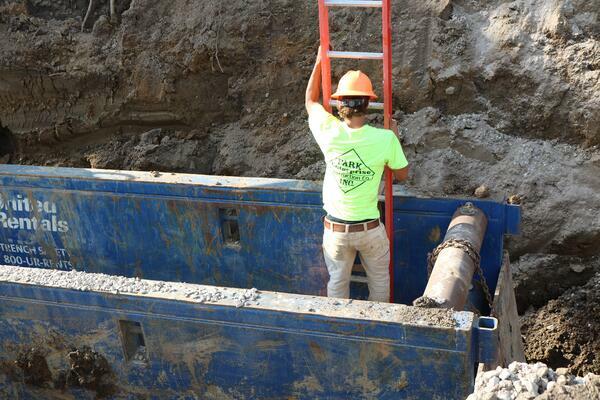 However, the burden is not solely on the contractor -- it’s important to ask any contractor you have hired about their trench safety practices, and hold them accountable for following OSHA standards. Familiarizing yourself with OSHA trench safety guidelines helps protect you from liability down the line. We’ve provided a general overview of trenching and the hazards involved, as well as important questions to ask your contractor so you can be informed of their practices and compliance. The greatest risk during trenching and excavation work is cave-ins, as one cubic yard of soil can weigh as much as an average car! Other potential risks include falling loads and hazards presented by mobile equipment. OSHA Excavation Standards apply to all open excavations made in the Earth's surface, including trenches, and following the set standards will significantly reduce the risk of cave-ins and other hazards. Who is Leading the Excavation? OSHA stipulates that a "competent person" must be designated by the contractor to identify existing and predictable hazards. Who is your contractor designating for these tasks? What are their qualifications? What technology are they using to limit human error? What is the Pre-planning Process? OSHA considers preplanning to be a critical phase of any excavation project and identifies lack of planning as a leading cause of on-the-job incidents. What is the contractor's normal pre-plan process? If it's missing entirely, cross that contractor off your list regardless of assurances made. Which Protective Systems Will Be Used? Preventing cave-ins requires the use of sloping, supports, and shielding the sides of the excavation and the work area. In some cases, a custom complex protective system is necessary depending on the soil type, depth, and other variables. Protective systems must also be regularly inspected during the project, and someone must be designated for that task. How Are Additional Hazards Addressed? Aside from cave-ins, what systems will your contractor use to ensure safety from additional hazards? For example, preventing objects from rolling or falling into a trenched area, warning systems for mobile equipment, and handling water accumulations. While the bulk of the responsibility will fall on the contractor to keep his or her workers safe, building owners must still take the time to ensure they've hired a contractor that's not only up-to-date on current OSHA requirements, but also is willing to use them. These questions are far from an exhaustive list of safety regulations, but they should give you a good indicator of whether a contractor is making safety a priority.